Yesterday on my way to work, I saw my first crocus of the season. I nearly cried. And on this morning’s commute, NPR told me that the sun rose at 7:11 am and will set at 7:11 pm, a whole twelve hours of daylight (and more!) from now until June 21st. Ahhhh! Spring! But as I’m traipsing past flowers and basking in 68 degree weather, my friends and family back home just survived another snowfall. This makes 2014/2015 the snowiest winter in Boston since 1995/1996. To be honest, I have no specific recollection of that winter. I’m sure I had lots of snow days, home from school, helping my parents shovel, taking my sled to St. John’s Seminary and riding down the hill on the backside of the property. I can’t imagine I had any complaints. It’s funny how adulthood and all its accompanying commitments change our perspective on the piles (and piles) of snow that accumulate on our yards and roofs and sidewalks and streets. For someone like me, who has still not acquired all the trappings of a legitimate adult life (like a car or a driveway or high heels or a child or a commute that requires actual commuting), I still love winter. My walk to work takes 40 minutes rain, snow, or shine, so it really makes no difference to me. The cold and snow make being inside cozy and being outside refreshing. Seriously, I have no complaints. And yet, these past few days of 60+ degree weather have been absolutely delightful. I want to go for walks without a destination in mind. I want to eat meals outside. I want to run all day long and picnic in the park down the street. But here’s where my complaint comes in. On this day in 1996, I was home from school. Not because of a snow day, but for “Evacuation Day”. Never heard of it? Don’t worry you’re not alone. It’s the ingenious holiday that the City of Boston invented to celebrate the day in 1776 when the British left town. The fact that this day conveniently coincides with St. Patrick’s day is, I’m sure, just a happy coincidence. There’s also Patriots’ Day in April, which is really Marathon Monday, and Bunker Hill Day on June 17. Boston knows how to give people a breather every once in a while. But I’m not in Boston, so for Evacuation Day 2015, I’m sitting in my office without an arbitrary holiday in sight. Come on D.C., surely we have something to celebrate that no one else would understand. Chuck Brown’s birthday? Or Marion Barry’s? The day the Washington monument was completed? There most be some random dates that we can decide are meaningful enough to warrant a holiday, but not so meaningful that it would be inappropriate to wile away the hours drinking with friends at a rooftop bar. Someone should campaign for mayor on this platform. She has my vote. While we are not celebrating St. Patrick’s Day (ahem, “Evacuation Day”) today, Matt and I were very luck to be able to celebrate this weekend at a friend’s house over steaming plates of corned beef and cabbage. It was exactly the type of meal you want to hunker down over after a long walk in the drizzle. It’s a lovely tradition and I enjoyed every bite. And yet, back at Chez Krauss, we are sticking with our vegetarian ways (for now). It must be this springtime weather convincing my belly that beans are better than beef. 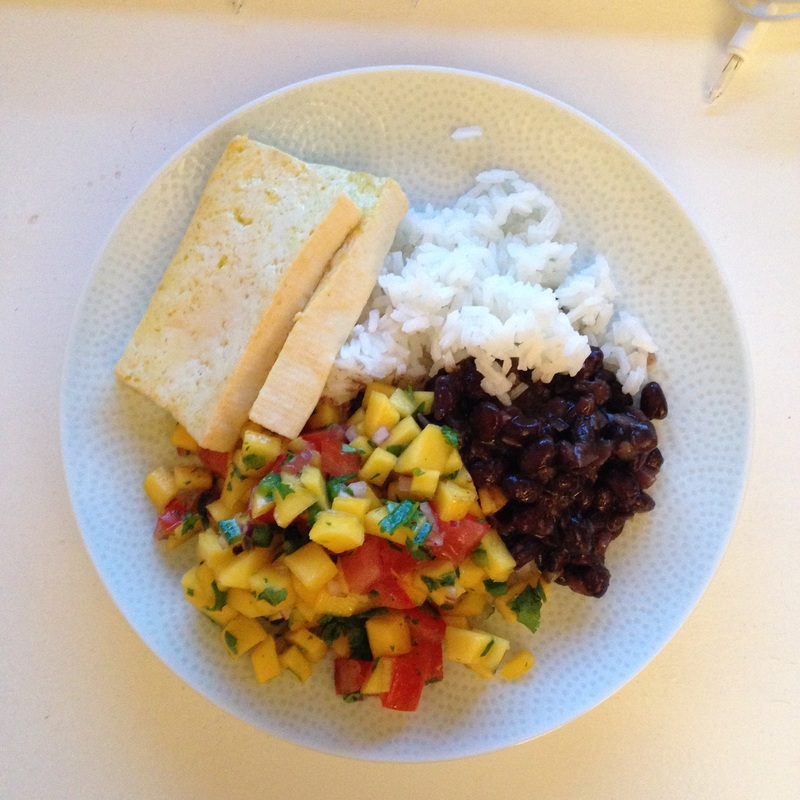 Last night, I diced mangoes and seared tofu with the kitchen door wide open, letting the sound of our neighbor’s wind chime twinkle through the screen. The meal was light and refreshing and satisfying too, much like the weather that inspired it. Tonight I’m happily eating the leftovers. So, Happy St. Patty’s Day/Evacuation Day/Random Tuesday in March, friends! I hope you enjoyed it – work, adult responsibilities, and all – and that you found the time today to take a much deserved celebratory breather. 1. To make the rice, bring 2 1/4 cups of water to a boil in a small saucepan. Add the rice and salt, cover and simmer over low heat for 20 minutes. Fluff with a fork before serving. 2. To prepare the beans, warm the oil over medium heat in a large skillet. Add the onion and cumin and saute for 5 minutes. Add the ginger and garlic and saute for 2 more minutes. Add the beans with their liquid and simmer until thickened, about 5 minutes. 3. To prepare the tofu, warm a large nonstick skillet over high heat. Add the tofu to the pan and sprinkle it with salt. Cook until browned on each side, about 3 minutes per side. 4. Meanwhile, make the salsa. In a medium bowl, combine the mangoes, tomato, cilantro, lemon juice, onion, jalapeno, oil and salt; mix to combine. Tags: light meal, tofu, vegan, vegetarian | Permalink. Thank you! I just poked around your blog a bit, and your photography is BEAUTIFUL.